WASHINGTON, DC (July 26, 2018) – As Congress prepares to break for the summer recess, Iraq and Afghanistan Veterans of America (IAVA), the non-partisan, leading voice for the Post-9/11 generation of veterans, will unite allies and elected leaders at the Reserve Officers Association of the United States (ROA) office in Washington to continue to bring attention to the urgent issue of burn pits, and to celebrate the momentum on our efforts to create public awareness, policy change and direct support. Burn pits may be the Agent Orange of our generation. They were a common way to dispose of waste at military sites in Iraq and Afghanistan, particularly between 2001 and 2010. There are other hazards beyond burn pits that occur in Iraq and Afghanistan that may pose danger for respiratory illnesses, including high levels of fine dust and exposure to other airborne hazards. Upwards of 3.5 million servicemembers may have been impacted so far, and according to IAVA’s most recent member survey , 80% of veteran respondents were exposed to burn pits during their deployments and over 60% of those exposed reported having symptoms. This spring, IAVA introduced it’s Big 6 Advocacy Priorities, and launched a national campaign to focus on burn pits. IAVA members have sounded off loud and clear, and have demanded national leaders respond. 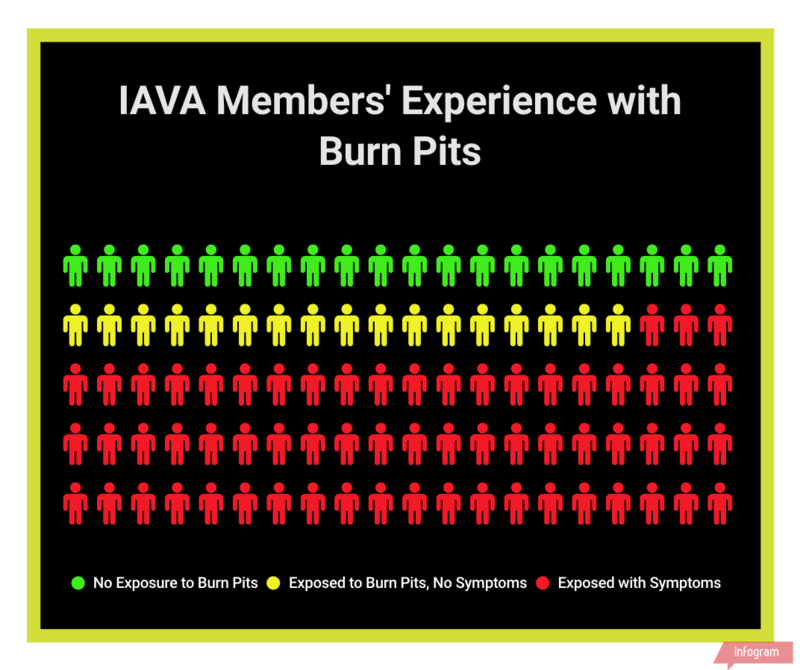 80% of IAVA veteran respondents were exposed to burn pits. After months of grassroot activation, media advocacy, educational efforts and online mobilization, the Burn Pits Accountability Act was introduced in May in the House by Post-9/11 veterans and Representatives Tulsi Gabbard (D-HI) and Brian Mast (R-FL). This united, bipartisan effort has jump-started a national movement demanding action. As we near the summer recess, IAVA is pleased to celebrate that our campaign has gained tremendous momentum. After millions of people were reached online and through broadcast media, we can now proudly share that we have secured over 100 co-sponsors, the 111th being Representative Ron Kind (D-WI). Today, we are also uniting to celebrate the recent introduction of the bipartisan Senate companion bill (S. 3181), led by co-sponsors Senators Amy Klobuchar (D-MN), a longtime veterans advocate and Dan Sullivan (R-AK), himself a Marine Corps veteran. We applaud Senators Klobuchar and Sullivan for listening to our veterans–and for stepping forward to lead on the urgent issue of burn pits alongside IAVA and so many others. The Burn Pits Accountability Act finally will bring accountability to the Department of Defense and require the department to record and report military exposures to burn pits and airborne toxins. 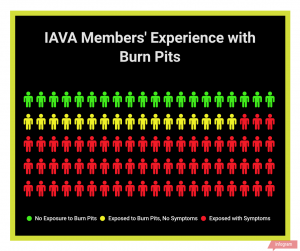 This spring, IAVA release a powerful 45-second public service announcement, called “Burn Pits”, which can be viewed online here . IAVA invites all media leaders to donate broadcast time and online space to run this PSA and help support our veterans.